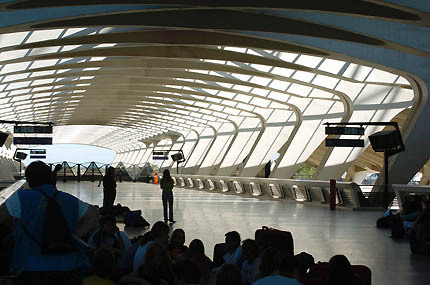 Calatrava's expressive railway station hall is built astride an existing TGV (high-speed train) track adjacent to Lyon airport. 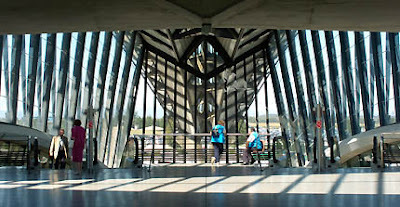 It provides a TGV station for the airport, but also a connection point for both TGV and airplanes into the regional road and rail system. 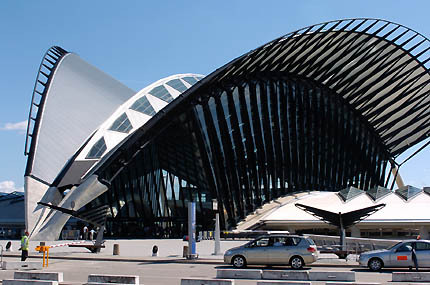 The building's most striking profile, based on two converging steel arches 120 meters long and 40 meters high. The building is most obviously expressive of a bird, symbolizing flight with even more dynamism than Saarinen's TWA terminal in New York, the two main arches coming together at the bird's beak. Calatrava insists this was not its origin: "I never thought of a bird, but more of the research that I am sometimes pretentious enough to call sculpture" - which is inspired more by the shape of the human eye. 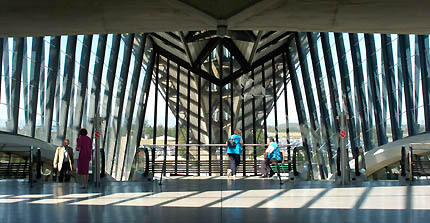 Arriving from the airport, one enters the hall from a connecting pier, arriving at the 'back of the bird', at an elevated level. Escalators lead down into the main concourse, from which wings spread out on either side above the railway tracks, with further escalators down to the platforms. The expressiveness of Calatrava's structure continues inside the building as much as outside. Two concrete 'tongues' are cantilevered like the prows of ships over the main concourse. The disappointment is that the energy of the building is not matched by its role as a transport hub. Catering for only a handful of TGV trains per day, the cavernous concourses spend most of their time looking successfully prestigious but also rather empty and unexploited. The 'tongues', for example, would be wondeful café spaces, but remain empty decks.